Most women experience premenstrual syndrome (PMS) during their reproductive years. 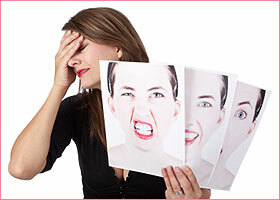 It is experienced before the monthly flow, and for many women it is characterized by mood swings. Mood swings during periods are thought to be caused by the fluctuations of hormones in the body. This article will focus on the possible causes of this condition as well as how to handle the raging emotions. What Causes Mood Swings During Periods? Though research has not conclusively reported the causes of menstrual related mood swings, the erratic emotions, can be linked to the hormonal fluctuations throughout the menstrual cycle, especially estrogen. After the end of a woman’s period, estrogen slowly increases and 2 weeks later it is at its peak. The levels then drop suddenly and rise slowly again before dropping once more just before the period. These peaks and valleys of the hormone are assumed to be the root cause of menstrual symptoms including mood swings. The emotion changes are not directly caused by stressful situations like a job change or divorce, but they can make the symptoms worse. When experiencing premenstrual syndrome you get a number of symptoms including mood swings, depression, irritability, fatigue, food cravings, bloating and tender breasts. For 7-10 days before your period and a day or 2 after bleeding starts, you might experience PMS symptoms. Some women get severe symptoms that affect their day to day lives. Irrespective of severity of symptoms, after bleeding begins, they will fade away. Premenstrual dysphoric disorder is a serious and in some cases disabling extension of PMS. As much as PMDD and PMS have emotional and physical symptoms, PMDD is known to cause major mood swings that are bad enough to come between you and your relationships as well as work. Exercise can improve depression and lift moods. It is thought that feel good chemicals – endorphins – are released during physical activity. This will assist with hormonal fluctuations that cause mood swings. Exercise will also help with bloating and cramps as well as boosting your energy as well. Aerobic exercises like walking, swimming, cycling and running are recommended. Eating small portions throughout the day instead of 2 heavy meals can also help with menstrual related mood swings. A heavy meal with high carbohydrate concentration is likely to cause blood sugar swings which could end up making mood swings worse. Irritability and crying spells are also related to low blood sugar. To keep your blood sugar steady, eat 6 meals daily with small servings. Studies have shown that taking calcium supplements of 500mg tablet twice a day significantly reduced the fatigue and depression levels in women with PMS. Several studies have shown plenty of calcium assists with mood swings during periods. Avoiding coffee and caffeinated drinks 2 weeks prior to your period will make a difference in your mood fluctuations. Caffeine is thought to increase insomnia, nervousness and anxiety. Alcohol is a depressant, thus reducing your consumption will be helpful. During the week before your period, it is advisable to stay away from soda, sweets and foods with lots of sugars. This will decrease blood sugar fluctuations and consequently reducing the likelihood of mood swings. Stress will only make mood swings worse. You can try relaxation methods like deep breathing and meditation. Therapy, whether group or individual, is helpful for women with serious mood swings during periods. Though it is yet to be rubber stumped by clinical studies, yoga has proven to help treat moodiness. Adequate sleep time, the recommended 8 hours come a long way in assisting you to control your moods. Massage is also good for emotional fluctuations. Many women’s mood swings during periods can be controlled by natural progesterone supplements. Products like hormonal cream help and they do not need a prescription. Apply the cream 2 weeks before your period. Known side effects include mild lethargy, drowsiness and headaches though rare. Symptoms like headaches, depression, anxiety, cramps and mood swings can be relieved by this cream. However, it might not take away all the symptoms. It should be effective 1 hour after application. Selective serotonin reuptake inhibitors (SSRIs) like sertraline (Zoloft) and fluoxetine (Sarafem, Proxac, etc.) can decrease PMS symptoms like fatigue, emotional outbursts, food cravings as well as sleep problems. Symptoms of PMDD can be reduced by taking SSRIs in intervals between ovulation and beginning of periods or throughout the month. PMDD and PMS symptoms can be decreased by taking birth control pills with a shortened or no pill-free interval.